So, after hearing about the Socks for Centenary project I came across another fabulous community initiative to mark the 100 ANZAC commemoration, 5000 Poppies. From its association with poppies flowering in the spring of 1915 on the battlefields of Belgium, France and Gallipoli, the poppy has become a symbol of both great loss in war and hope for those left behind. 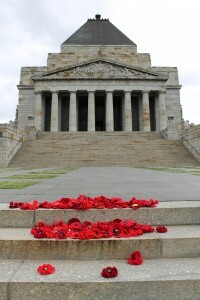 As part of the 2015 Anzac commemorations, the 5000 Poppies project group will be ‘planting’ a field of more than 5,000 poppies in Federation Square, Melbourne, as a stunning visual tribute to Australian service men and women for more than a century of service in all wars, conflicts and peacekeeping operations. The group is inviting all crafters to participate in this meaningful and heartfelt project. Contributors can make one or more poppies, which can be crocheted, knitted, felted or sewn from any materials. Contributors are asked to provide their own materials, but there is no entry fee and no limit to the amount of poppies that can be submitted. Patterns, information and inspiration can be found at the blog 5000poppies.wordpress.com. Such a fun idea, right? And easy. And so many options, crocheted poppies, knitted poppies, felt poppies. There is definitely something for everybody here in this project and plenty of pattern choices listed on the project’s website here. As of this writing I understand the project organisers have received close to 100,000 poppies (!!) so well over what was their initial goal. The problem now is to raise enough funds to be able to display all the poppies on Federation Square as originally planned. It turns out that a 100,000 poppy installation is much more costly than a 5,000 poppy installation(who knew?). The space required is approximately 1200 square metres, nearly 13,000 square feet or 1/3 acre for those who still count in old money. That’s about the size of our entire house plus the land it sits on! HUGE! Then there’s transport and storage costs, rigging and equipment hire, strict OH&S guidelines governing public art installations that must be complied with, along with public liability insurance. I can see how the costs have added up. The organisers have launched a crowdfunding campaign on POZIBLE to raise the $50,000 (!!!) needed for the project’s installation but they are well short of their goal. Please consider contributing to the cost of this amazing art piece. So, of course, I had to crochet up a little poppy of my own to send in as part of my contribution and in memory of my Great Grandfather who fought in the trenches in France and Belgium. I remember at his funeral the other men of our family who had served in the armed forces all wearing crepe paper poppies on their lapels. At the conclusion of the service they all removed their red lapel poppies and laid them on the casket. A solemn and poignant moment for even this, self-involved and clueless, teen. Red poppies not only remind me (and so many others) of the sacrifice so many young men and women have made and continue to make to preserve our freedoms but remind me of my Great Grandpop. The idea reminds me of this extraordinary poppy art installation completed at the Tower of London in 2014. The final poppy was planted in the moat of the Tower of London at 11am on Armistice Day. The installation is entitled ‘Blood Swept Lands and Seas of Red’ and is comprised of 888,246 ceramic poppies, each representing a British or Commonwealth military fatality during the First World War. Ah.May.Zing. An Australian girl, far from home, growing greens, collecting eggs, and canning the lot in our 1/3 acre suburban home in The South.